Even the Steinway itself appeared to have been designed for this Beethoven-Perahia, channeling the pianist’s range of dynamics and brining out gossamer everywhere. And so thankfully, too, Perahia had our eyes redirected to a mind that was purely on Beethoven’s matchless work. Only a little lithe lift of a hand here and there could be observed. There was one rare moment coming toward the end of the slow middle movement where both eye and ear were in a duet of sorts. With the right hand alone on the keys, Perahia brought his left hand into a conducting role allowing to be keenly traced those amazing subtleties going on in fluid tempo. Together the BSO and Perahia achieved a truly elevated state of psychological play in that interior movement, where incisively biting strings finally gave way to a persevering and persuading piano. Ironically, it all seemed all too real. 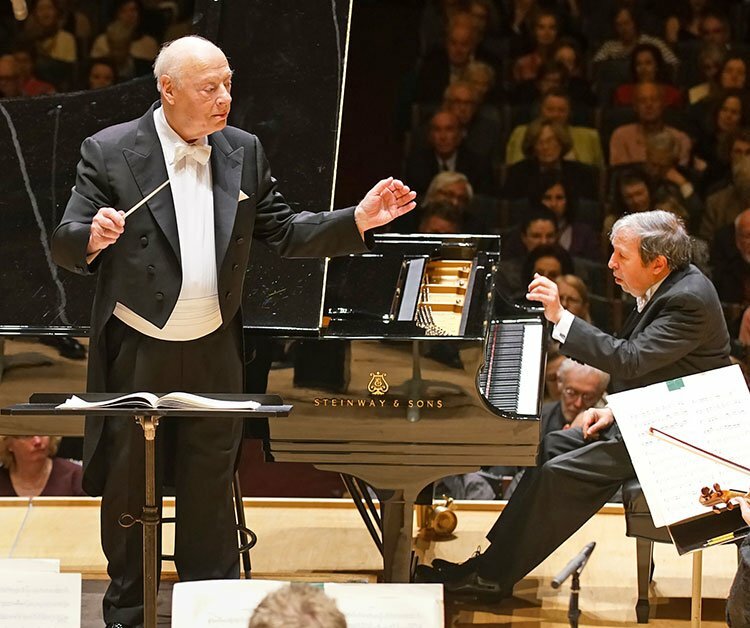 Common ground was found throughout, Haitink and Perahia matched up sharing an idealistic purview of the Beethoven concerto, conductor and pianist undeniably sanctioning bliss. Over a considerable portion of this half-hour plus composition, especially in the opening allegro moderato movement, came abundances of diatonic and chromatic scalar passages. Perahia integrated these virtuosic leaning passages into an expressive whole, all the while continually redefining and refining their meaning. Perahia played Beethoven’s own cadenzas with directness that had that in-the-moment feel that genuine improvisation can create. From the ignited hall came standing ovations. Happily, this remarkably intimate utopia, remained intact as Perahia offered no encore. Mahler’s much different naturescape from a young age followed. Symphony No. 1 in D Major is explicit. Unlike the sublime idyl of the Beethoven concerto, Mahler brought rustic notions, birdcalls, marches and waltzes, all in all, nature along with human nature heralded with fanfare. Conductor Emeritus Bernard Haitink is on the cover of this week’s Boston Symphony Orchestra program booklet, which reads “Celebrating Bernard Haitink’s 45th Anniversary With the BSO.” With noble baton in the right hand and tremolo-like left hand, this most revered conductor led Mahler’s hour-long first symphony. With its oft sustained pedal points or droned tones, its ostinatos or clips of notes repeated over and again, its preoccupation with a certain melodic interval that at first imitates a bird, and its reliance on repetition in general, this symphony more often than not moved at a snail’s pace. Haitink’s eye on harnessing the myriad details in orchestration, the melodic flashbacks, and the inevitable fanfares, this Mahler really put the spotlight on the orchestra. Thursday night’s performance of the somewhat time-worn “Titan” symphony, as it is nicknamed, illustrated superior orchestral painting—tinted and blushed till it glowed. A single richly golden bass note from the harp as underpinning, woodwinds in delicately hued timbral play, and six horns standing in unison of brave brightness, these were just moments from a magnificent maze of instrumental color. A tentative opening and an odd sound to end the second movement could hardly mar this performance. Haitink’s association with the first symphony yielded a bounty of insightful glimpses of the Mahler to come in later symphonies, where emotional depth intensifies. The final movement marked “With tempestuous motion” finally sought victory. I could not help remembering a soundtrack of John Williams. A huge “Ooh” roiled around the hall for each individual and section, swelling finally for the entire corps. It has been a while since Symphony Hall thus erupted. It really was a great concert. We are so lucky to have had the opportunity to hear Bernard Haitink make often great music during his many years in Boston. For me at least, it’s gotten to the point that I’ll go to any concert Haitink conducts even if I’m not wild about the program. Thank you, Maestro Haitink, for so many years of such distinguished and memorable music-making. I still remember the phenomenal Bruckner 7 Haitink led about a decade ago. Last night’s concert was certainly one of the better ones too. And thank you, BSO, for a really well-played and heartfelt concert Thursday night. The piano concerto suffered from a number of poor entrances and fairly uninspired orchestral playing-I thought the Mahler was pretty flat until the last movement-sorry Boston, no need for yet another standing ovation. The entire night felt like a rehearsal-as a comparison I heard salonen and the LA Phil play a stunning Mahler 1avfew weeks back-this didn’t touch that. I’m a big Perahia fan, and I looked forward to this concert all year. In fact, I attended Thursday and will attend on Saturday as well. The Mahler was almost a lagniappe. I’ve seen three other BSO Beethoven PC 4s and three other BSO Mahler Firsts, so I thought I had something to compare these performances to. It seemed to me that in the Mahler Maestro Haitink marshalled the BSO into an inspired performance. What a joy to see my favorite guest conductor work his old magic. I thought the Beethoven was played well and flawlessly (as far as I could tell), but I agree with Mr. Stein that it was “fairly uninspired”. I thought that it didn’t have the poignancy, mystery and beauty that it can present. The Ivan Moravec performance with Turnovsky and the Vienna Musikgesellschaft (VAI Audio cd) is the absolute benchmark for me. There is lyricism, beauty, and a profundity in that performance that yesterday’s live performance couldn’t match. I am hopeful that tomorrow’s performance will make me feel differently. If not, well, another chance to enjoy the Mahler. Right on, edente. One more thought on the Mahler. The beginning with off-stage trumpets (and no open door) worked well with Haitink’s masterful, slow ascent from ppp to crescendo. Had me thinking about Liu’s comment that he once was told that every movement should have but one climax (debatable), and the first was not the only one in that movement. But it was so masterfully and satisfyingly done by Haitink. So i did not have the reservations about it. I loved the entire performance. Haitink’s Shostakovich ain’t bad, either. Not wishing to experience a square, sober Mahler, I ducked over to hear Jeremy Denk’s Schubert across the street after intermission. It was a moderate Titan; at the end. the horns stood up, but they did not drown out the trombones. Haitink is a conductor of moderate temperament, which has many advantages. He sees all the details of the music, and does not obscure the small ones in favor of everything that is most emphatic. He uses all the dynamic range of which an orchestra is capable, including all of the middle range, which means he can bring forth articulations and phrasings impossible to a conductor who only knows ppp and fff and a sort of vague space in between. The BSO shares this moderate temperament, and its virtues, which is probably why they and Haitink get along so well. It is also why they are better off with a music director with more fire, such as Levine or Nelsons. Too much of a conductor with whom they are so congenial could lead to slackness, as I am told happened with Ozawa. Though moderate, it was not “sober and square”. Haitink really understands Mahler’s circuitous excursions, which actually seem to go somewhere when he conducts, though by strange and unexpected paths. In many performances these are mere episodes, possibly interesting but unmotivated. Haitink also grasps Mahler’s irony, though at a distance, without fully embracing it. Nelsons, on the other hand, embraces it without fully grasping it. Nelsons has great romantic passion and fire, but it is the excitement of the romantic enthusiast, not the rage and despair of the romantic hero. He admires these attributes greatly, and mimics them enthusiastically (since he is an enthusiast), but they are not really part of his happy nature; which is why he can’t quite get the sneer in Shostakovich, as others have noted. Manacle his soul on the Red Sea bottom. PS to Camilli – you made a terrible mistake. The Mahler was very good, though moderate; and the first half of the Denk recital was utterly brilliant and wonderful and amazing. Live and learn on the dance/rag program. But the Schubert was marvellous in ways that I have never experienced before– while I have heard my share of good Mahler and good BSO playing. Oops. I forgot to say in my comment to edente, that I was delighted that he mentioned Moravec; we don’t hear his name often (RIP), these days. I LOVE his playing; have his recordings of Chopin and Debussy. Tried to see him in Prague in 1989, but he was recovering from his hand operation. Did meet his daughter’s husband’s delightful mother in our compartment of the train from Prague back to Paris (with interesting story about Communist hampering of travel outside of Czechoslovakia prior to that year…), and DID see hear in London,a few years later. Learned about him from James Christie – bless you, Jim. All very nice… But the really remarkable Beethoven playing was in Jordan Hall on Monday night with Richard Stoltzman and Bruce Brubaker and Larry Lesser. They romped through the Trio Opus 11 — and not only romped, because the slow movement was suddenly and heart-wrenchingy sublime! Haitink’s many CD releases are mostly at commercial level, but he does have a reputation of being able to sometimes produce impressive concert results. I am afraid the chance of seeing him again is diminishing… However I am going to miss him even less than Abbado. I have not listened all his Mahler 1st CDs, but general impression was not great. BSO under him was probably much worse than under Morlot a few years ago. That performance was with more spirit, at least in my memory. At his age, the conductor could not maintain his concentration for a single long movement. The BSO was never flawless. Please, please, don’t make important mistakes in the next concert. The PC4 2nd movement was a surprise. The orchestra was quite sharp there.